So yesterday was an awful day to have a birthday... After getting an allergic reaction to the pain killers, I went back to the hospital to get treated. I went to the ER where they gave me two shots (on my arm and on the vein in my hand.) After getting the shots, I fell asleep for a bit till the doctor woke me up and signed my release form, along with the advice that I can't eat seafood, chicken, dairy products, and chocolates. I also can't drink soda AND BEER for 1 week. dammit. So the good news (about me, of course...) is my eyes aren't swollen anymore, and even if the pain killers made my eyes swell, it actually worked because I got to sleep without being woken up by the pain from me rubbing into the rashes. AND I get to work from home until I'm not contagious anymore. Random Spittings of a frustrated musician/writer/tennis player who has yet to meet a quarter-life crisis he didn't vaguely blog about. I woke up at 4 am because I was feeling pain from the rashes from my shingles. I had a hard time going back to sleep after that. Went to the doctor after having lunch (spaghetti that my mom cooked, since she knows that's my favorite) to get my shingles checked and got prescribed an anti-viral drug and pain killers by the doctor. So I took the pain killers because the rashes (which weren't really rashes anymore but were blisters on my upper back and chest) were really painful... And it turned out that I'm allergic to the pain killers, so now my right eye and eyelids are swollen, just like what happens when I take aspirin and ibuprofen..
And the day isn't even close to ending yet. After breaking into the top 10 a few months ago, Victoria Azarenka of Belarus and wins the biggest tournament of her career by beating world no. 1 Serena Williams at the SonyEricsson Open in Miami. After announcing that they're having a baby this summer, Roger Federer and his longtime girlfriend Mirka Vavrinec got married last week in Switzerland, just before Fed flew in to Monaco for the Monte Carlo Masters. And apparently, Andy Roddick has also gotten married to his fiancee, swimsuit model Brooklyn Decker. Even more bad news for Serena, she will lose her top ranking to Dinara Safina by next week, after Serena lost in the first round in Marbella, Spain and pulling out of the Family Circle Cup in Charleston. Dinara will head into the clay court season as the #1 player in the world while attempting to win her first Grand Slam title on her favorite surface and prove that she deserves the top ranking as much as Jelena Jankovic did last year. Dinara and her older brother Marat Safin will also be the first brother-sister players to ever be ranked #1 in the world. Marat held the #1 ranking before the Federer era. The French Open starts in a little over a month. It kinda makes you want to... break into song? I love Coron, in all its greatness. Boom de ya da, boom de ya da, boom de ya da, boom de ya da! 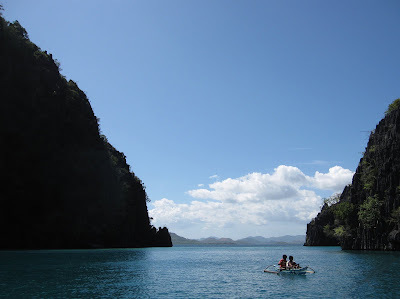 I love Coron, and all it's awesomeness! Boom de ya da, boom de ya da, boom de ya da, boom de ya da!!! and check out ceravi, miabaybeh, randmcnally and firithduialion39 on multiply for more pics.